This progressive surf course at Linha de Onda will have you well prepared for a surfing future. The course includes surfing lessons every day and is designed for absolute beginners, but all levels are welcome. They teach everything you will need to know such as paddling, standing up, dropping into waves, and riding across them. Plus, learning about surf etiquette, board design, and waves types will ensure you leave with confidence and ready to surf forever. You will be staying in Linha de Onda's partner hostel, located right in the city center where you can enjoy what Porto's vibrant nightlife, great restaurants and bars, and amazing sightseeing. Alvaro, also known as Bibas, was born in Porto and raised between South Africa and Portugal. He has been surfing for over 20 years, is highly experienced as an ISA Level 1 and 2 Surfing Coach, and a Certified Surf Instructor by the Portuguese Surfing Federation. Headcoach at Linha de Onda Surfing School, he is very easy going, friendly and makes every surf session be worth it. He has been developing advanced surf coaching programs to prepare aspiring surf champions to compete in national championships, and surf courses which aim to improve the performance of beginners and intermediate levels. Born and raised in Porto, Tiago discovered surf a long time ago. He has always been attracted to the ocean, not only to its waves but also to its dynamics and ecosystems. This drove him to a Marine Biology Bachelor's Degree and teaching surf lessons at Linha de Onda just for fun. He ended up realizing that it was incredibly rewarding to share his passion with others and so he looking forward to doing it with you! 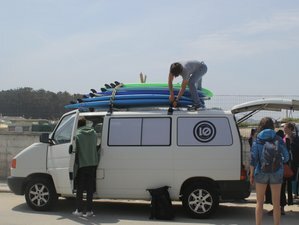 This surf camp will take place in Porto, Portugal. Linha de Onda believes that surf is a lot more than just a sport. At Linha de Onda, they share their values and their passion about the waves. For each additional person, a discount of 5% is available.